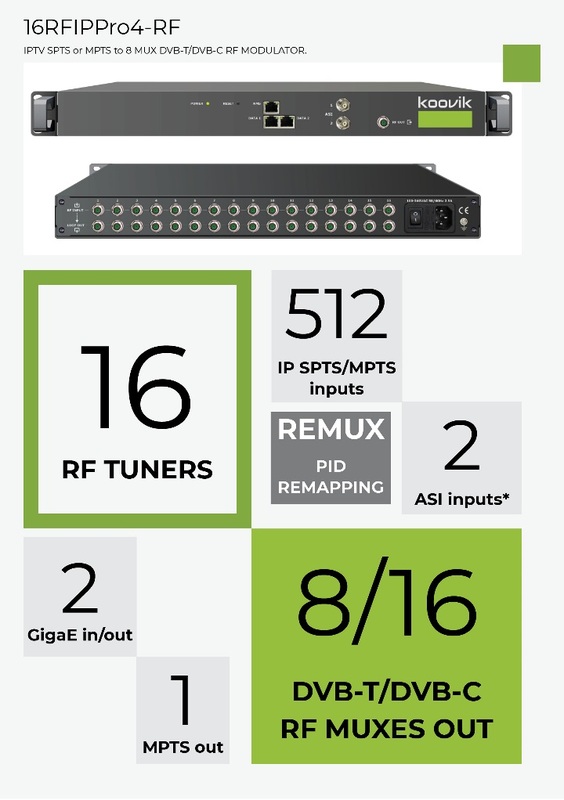 16 DIGITAL RF TUNERS. DVB-S2, DVB-T or QAM. 8 DVB-T MUX OUT* or 16 DVB-C OUT* + 1 x MPTS IP mirror of 1 RF MUX. multiplexer PID filtering and remapping (max. 128 PIDs' per RF MUX). PSI/SI table generation, and edition. PCR adjust. IP MPTS 1 MPTS Unicast or Multicast. Over UDP/RTP/RTSP. Mirror of one output RF Mux.